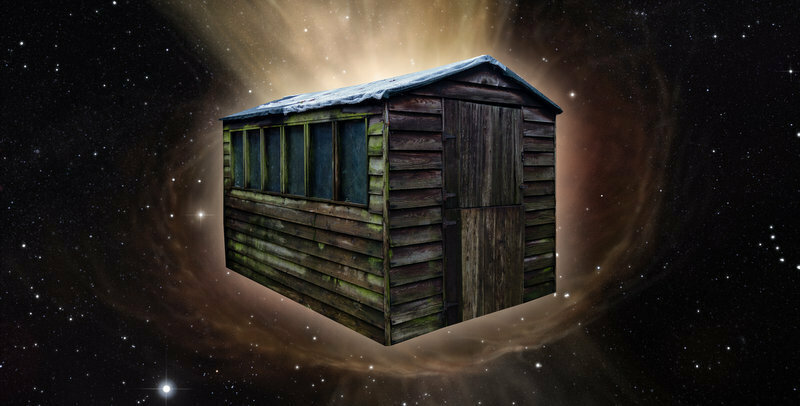 The Cosmic Shed is a podcast about science fact, science fiction and everything in between. Winner of Guardians Favourite Podcasts 2018. Guests include Apollo astronauts, A list actors and groundbreaking scientists. We about films, books, music, theatre, TV, and anything else that catches our curiosity, from rigorously accurate science fact to ridiculously speculative science fiction. We don't want to nitpick, but to celebrate the ways science and art can complement and enrich each other. Mostly we just want to talk about nerdy things that make us happy. We’ve decided to do all of this from a crumbling garden shed, somewhere in Bristol. We started out with Ben, Andrew and Laura as hosts. Only Andrew remains regularly but Ben pops in now and again with a poem. The shed has been enhanced with some homemade weather-proofing, a lick of celestial black paint, three otherworldly armchairs, and a Japanese DIY star projector. Oh, and fitted with microphones to record our babble. We don’t have the budget for a device to control the weather, so any atmospheric sounds you hear are from the garden just beyond the shed’s thin wooden walls. You can subscribe to The Cosmic Shed if you would like to automatically receive new episodes. You can also subscribe using iTunes or Feedburner. Visit our Patreon page to see a video of us in the Shed, and think about supporting us. Go to audibletrial.com/thecosmicshed for a month's free trial of Audible, and a free audiobook of your choice. To continue the conversation or to suggest topics for future episodes, join us on Facebook, or follow @thecosmicshed on Twitter. When discussing the film, book or show that's the main focus of our episode, we will usually talk about the whole of the narrative. If you're worried about being spoiled, we would advise watching, reading or listening to whatever we're talking about before listening to the episode. We'll try not to give spoilers for any other films/books etc. we happen to mention. Except Man of Steel (see episode 1). The Cosmic Shed is supported by The Lab, who provide us with delicious free coffee for our recording sessions courtesy of their Slow Brew Club subscription service. To find out more visit Slow Brew Club, follow @thelabcc on Twitter, or join them on Facebook. We love podcasts, and try to listen to them as often as possible. On the bus, in the shower, while walking around, cooking or doing the washing up - there are very few situations which podcasts can't enhance. If you're new to podcasts, the sheer number of shows, and options for playing them can be a little overwhelming, so we thought it would be handy to offer a few pointers. Many podcast fans use iTunes to automatically download the latest episodes of their favourite shows, and sync them to their iDevice of choice. To get started (on a Mac or a PC), visit the iTunes store and find the Podcasts section. Choose a show that looks interesting and hit the subscribe button to download episodes. Then visit My Podcasts to play episodes on your computer, and to manage your subscriptions. Episodes will then automatically sync to your iPhone, iPod or iPad, for you to listen to at your leisure. Or at work, of course. There are many excellent apps for downloading and streaming podcasts to your Android, Apple or Windows phone or tablet. These mostly work in a similar way to iTunes, allowing you to subscribe to shows that you find interesting, and receive automatic updates. And many more from the BBC, NPR, Nerdist and Maximum Fun. If you need more information on podcasts, have a look at this handy guide. Andrew also made a podcast called Dessert Lionel Discs, which features scientists talking about their favourite music in a camper van called Lionel and is the host of the Physics World Stories podcast. Ben runs a website called Love Aloud, where he posts audio and video stories of love, sexuality and relationships of all kinds.